This content was published: December 8, 2014. Phone numbers, email addresses, and other information may have changed. The woodpecker was only doing what came natural. 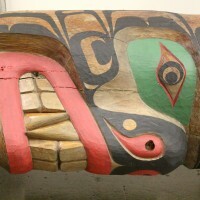 In British Columbia, Canada this wood-damaging bird, along with other things that pose hazards to Native-carved totem poles, wouldn’t have been given a second thought. But for Portland Community College and its prized 30-foot red cedar “Welcoming Pole” at the Sylvania Campus (12000 SW 49th Ave.) in Southwest Portland, it’s going to get a second life from rot, insects and, yes, woodpecker damage. Award-winning Kwagiulth Native Artist Richard Hunt (foreground) and Sylvania’s Division Dean of Visual & Performing Arts Gene Flores spent two days in November fixing holes, rot damage and repainting the totem pole with bright colors to restore it to its previous glory. 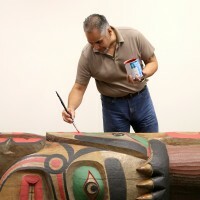 With paint brushes in hand and wood tools within reach, award-winning Kwagiulth Native Artist Richard Hunt and Sylvania’s Division Dean of Visual & Performing Arts Gene Flores spent two days in November fixing damage and repainting the totem pole with bright colors to restore it to its previous glory. The two were readying the pole for its final resting space inside the new semi-glass atrium entrance to the College Center at the campus. 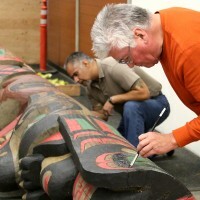 Hunt traveled down from his home studio in Victoria, B.C., to lead the effort to restore the last totem pole he ever carved and the only one of his that resides at an American community college. 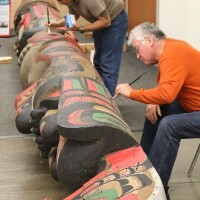 “I restore them a lot,” said Hunt, who has refurbished his own and Hunt family poles for the Queen of England in London, University of Pennsylvania, the Southwest Museum of the American Indian in Los Angeles and in many cities in Latin America, to name a few. “If this is on my own home territory we probably would just let it get old and fall down. A lot of them are in the graveyard and once they fall down their life has ended, and we just let it go back into the ground. But this one is considered art. 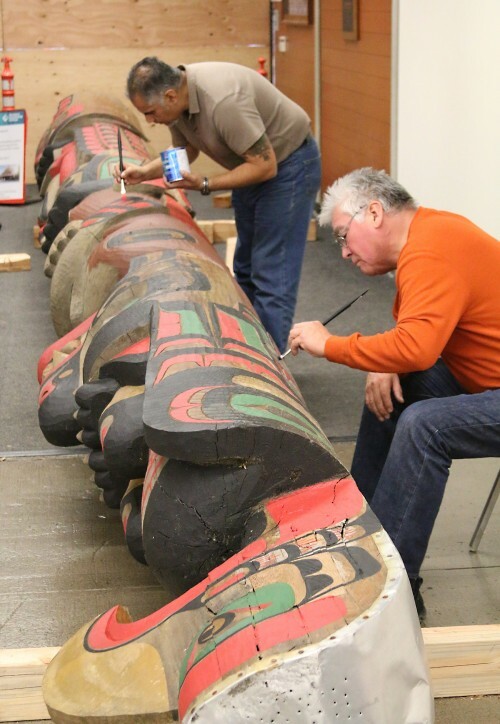 With the totem pole on its side in the Upper Mall of the College Center, Hunt and Flores tested their knees and backs by crouching down to paint every edge, smooth surface, and general nook and cranny. The pole will be lifted into its final resting space in early 2015. 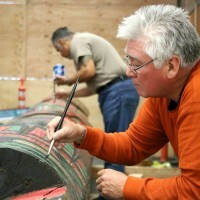 Hunt, who began carving at 12 years of age alongside his father Henry, is part of a four-generation carving and art family in northern Vancouver Island. 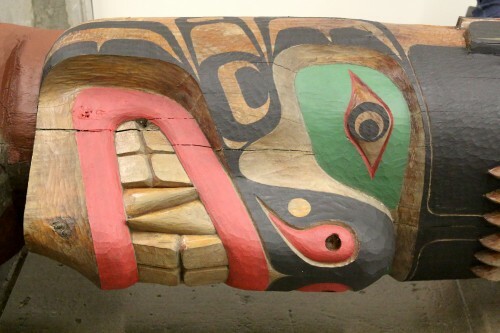 Hunt’s grandfather, Chief Mungo Martin, was largely responsible for the resurrection of Northwest Coast carving. 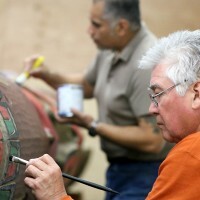 In 1973, Richard began working at the Royal British Columbia Museum as an apprentice carver under his father and the following year he assumed the duties as chief carver in the Thunderbird Park Carving program. He remained in that position until he left to become a full-time artist in 1986. Now, much like the generations before him, Richard Hunt has totem poles standing all over the world. Towering carved cedar totem poles are part of the heritage of the Pacific Northwest Native tribes. They are filled with the images and myths from their world like bear, thunderbird, killer whale, and the like. The PCC “Welcoming Pole” consists of Hunt’s family symbols – salmon, bear, eagle, snake and moon. 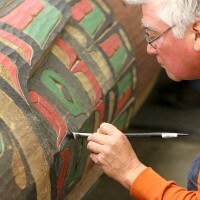 He said his whole family carves, continuing the tradition of one of Canada’s most respected carving clans. Towering carved cedar totem poles are part of the heritage of the Pacific Northwest Native tribes. They are filled with the images and myths from their world like bear, thunderbird, killer whale, and the like. 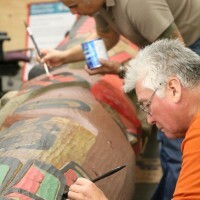 Hunt’s relationship with PCC began back in 2000 when visual arts faculty Marie Watt, part Seneca, led the way to commission a totem pole for the Sylvania Campus to welcome visitors. Watt, known for her artwork centered on contemporary Native American themes, connected with Hunt to start developing the pole after securing community donations to fund the project. It took him four months to carve the pole at his studio in Victoria and he then put the finishing touches on it at the Sylvania Campus just before the pole was erected among a grove of trees near the Performing Arts Center in the summer of 2001. The 30-foot totem pole had resided in that spot by the PAC, welcoming visitors to the campus, for more than 12 years. Hunt hasn’t touched the pole since its installation except for minor repair work in 2010. 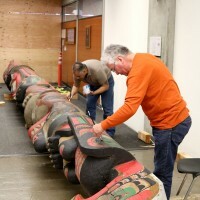 When PCC’s $374 million bond measure passed in 2008 to upgrade facilities and expand campuses across the district it was an opportunity to relocate the totem pole indoors when the College Center would have a new atrium constructed. Today, the “Working Exhibit” as he is known, doesn’t do large totem poles anymore. He focuses his time on creating his signature raven rattles, bowls, traditional masks, canoes, jewelry, paintings and silk screen prints that are sold throughout the world. “I’m not in a rush,” Hunt said of the way he works. “When it’s finished, it’s finished. As an artist there’s no weekend or whatever, it’s when your hands are sore. I take pride in what I do. I figure it’s a great way to go through life doing what you love and owning what you do. interesting I’m Alaska native from the Tlingit & Haida Tribe…Every time I had a chance to talk to them they were gone.